After releasing their album “Bleed Bleed Bleed” in 2012, band Thieves Like Us took an unexpected hiatus and different members of the band focus in their own lives. 5 years later, when everyone thought that the band had split up, they made a comeback with a self-tiled album and new band members, proving that they still have a lot to offer. The album is a symphony of different inspirations going from the funky, Prince-inspired “Dani,” to electro-psychedelic “Tears” and floating first single “Jennifer” reminding the best works of Blood Orange, Tame Impala and Animal Collective. Exploring the limits of different genres, they created over the years a full catalogue of super-hybrid albums. The band took some time to answer some our questions about the new members, the realization of the new album and the new-found chemistry. Highclouds: Your last album was in 2012 and you guys split up. What was the process of creation of this album? Since about 2011 there was and has been a lot of ambiguity about the inner fabric of Thieves Like Us. We began as two Swedes, Björn Berglund and Pontus Berghe, and an American (myself). We frequently relocated to other countries. We started the group in Berlin and then relocated to London. We were signed to Parlophone briefly in 2005. But that deal stalled and then fell through. We were fed up and wanted to try New York City, but we didn’t really fit in there. In 2007 Kitsuné in Paris released our single “Drugs In My Body.” We made a record for them, but they didn’t want to release it. We sort of waited around another year before Seayou Records in Vienna put it out. We went on to make “Again and Again” which was released by the Parisian label deBonton and then whilst still living in Paris, the Brooklyn-based label Captured Tracks contacted us. They released our instrumental record “Berlin,Alex” and then our last record “Bleed Bleed Bleed.” Except for the short short stint living in New York, we never lived in our countries of origin. We never really settled anywhere. We were pretty much living out of our suitcases with women supporting us. Around the time “Bleed Bleed Bleed” came out, I was back in Berlin, Pontus was in Milan, and Björn was in Paris. Bands do not function to well via long distances. I think between 2007 and 2012 we were constantly recording or touring and really had no time to reflect on how things were unfolding. As we put as much effort into all of our records, we were shattered at the lack of media coverage over “Bleed Bleed Bleed.” Captured Tracks had also just signed Diiv and Mac DeMarco. The label really didn’t push us. Understandably so. It’s much easier to market a nu-gaze band like Diiv, or an indie folk singer song writer like Mac. But Thieves Like Us is a square peg. We are totally a paradox. We aren’t from one country, and we might live in Berlin now, but we aren’t German. Sure we use some electronic programming and synths, but our music isn’t limited to being electronic. We are a little dreamy, but it’s not shoegaze, it’s quite funky. And, while it is danceable, no dj is gonna spin us on a dance floor. Our sound, record covers, and videos are seemingly glamorous, or sensual, but the texts are actually about social problems, war, and other political topics. And while the songs might be produced with an air of psychedelia or cosmic aesthetics, you can strip all of this off, and there are still songs there. One could make cover versions of all of our tunes in any style. People ask me what kind of music we make, and I cannot answer them. Maybe you want to have a listen to us and tell us what genre we fall under. But to go back to your question, I can’t say we broke up, I think the others were hurt by the lack of attention “Bleed Bleed Bleed” received from the “critical class” and rethought their position in the TLU constellation. 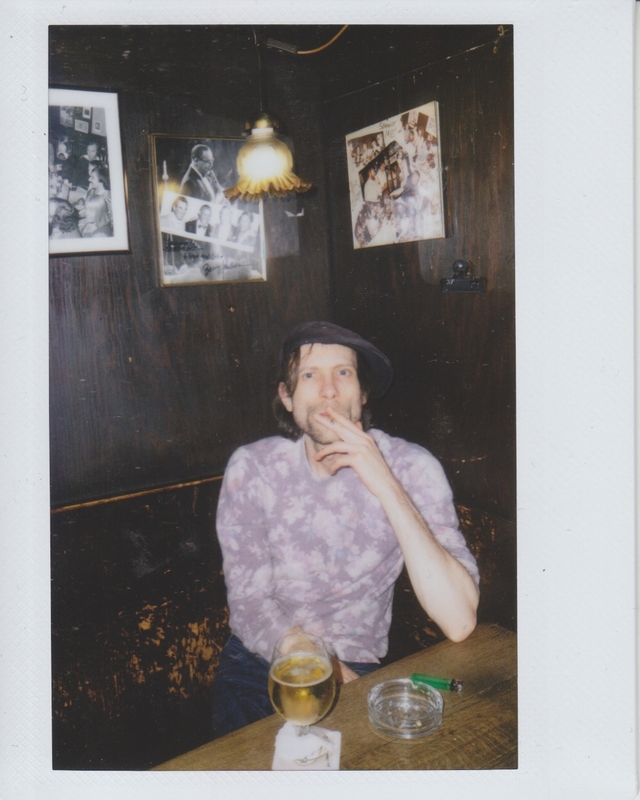 Pontus left to focus on his other music projects in Milan (The Quincey), and Björn went on a long sabbatical to meditate. I wrote these songs in 2013, alone. It just took time to realize them. The ship didn’t crash, it just broke down and needed repairs. Since all that happened, how different is your sound now, if you compare your last self-titled album to your previous works? Without Björn and Pontus it was very difficult to realize this record. I had no musicians. Berlin is not a band city. It’s a city for electronic music producers and deejays. While the songs were already written, finding symmetrical musicians took another year. Perhaps I could have recorded and programmed everything myself, but the end result would have been poor at best. I was lucky enough to meet Tore (drums) and Thom (bass) through friends of friends. Although our former records did have electric bass and some acoustic drums on them, they were accompanied with heavy programming. I still wanted to keep our synthetic sound, but I wanted to record the drums and bass live at the same time played synchronously in the same room. We overdubbed guitars and synths at home, but the rhythm backbone you hear on this album was recorded live. I am always aiming for more groove and more swing. Something you can’t sit down and do in your bedroom programming beats on a computer. Why not change the band’s name? I think to start over and rebuild everything from scratch would actually just be destroying the outlet we worked so hard to construct. I felt some sort of responsibility to the fans as well, to keep making records. I am a very big Byrds fan. David Crosby, Gene Clark, and Graham Parsons all played in the Byrds and left at some point. The Byrds made twelve studio records. Roger McGuinn, the band leader, was the only constant member. If he had stopped when members of the original lineup left we would have had no masterpiece “Sweetheart of the Rodeo” record, nor would Graham Parsons gone onto launch the Flying Burrito Brothers. Since Björn came back to the band and some other members joined you, how did you install a new chemistry between all of you? So far everything is very relaxed. We are all quite reserved personalities. We’ve managed to start making new songs already. But it might be awhile before we hear those. One large irony is that although Björn is not on a single recording on this record, his wife did do backing vocals on five songs. She sang on our last record as well. We wanted a congruent sound, so although he isn’t their, he sort if is present through his wife. Can you explain the cover of the album? 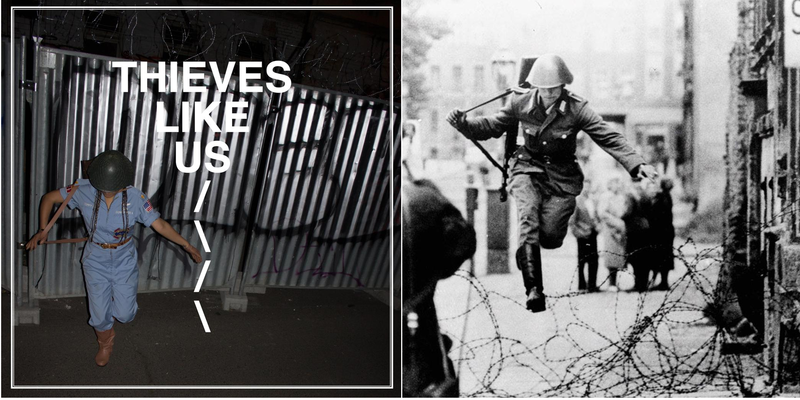 The album cover is a copy or homage to the 1961 photo of the East German border guard Conrad Schumann leaving his post and defecting to West Berlin. I had always liked this image. We shot it back in October. I couldn’t predict Trump would be elected president and be building a US-Mexican wall. It was my reflection on current events and refugees. I suppose I needed to slip the US FLAG in there as well on that uniform. It’s quite police looking. We even attached the barbed wire to the top of the metal barrier you see on the cover. We learned a lot about barbed wire those weeks. You can follow Thieves Like Us over Facebook, Twitter, Instagram and Soundcloud. And you listen can to their entire self-titled album here below.